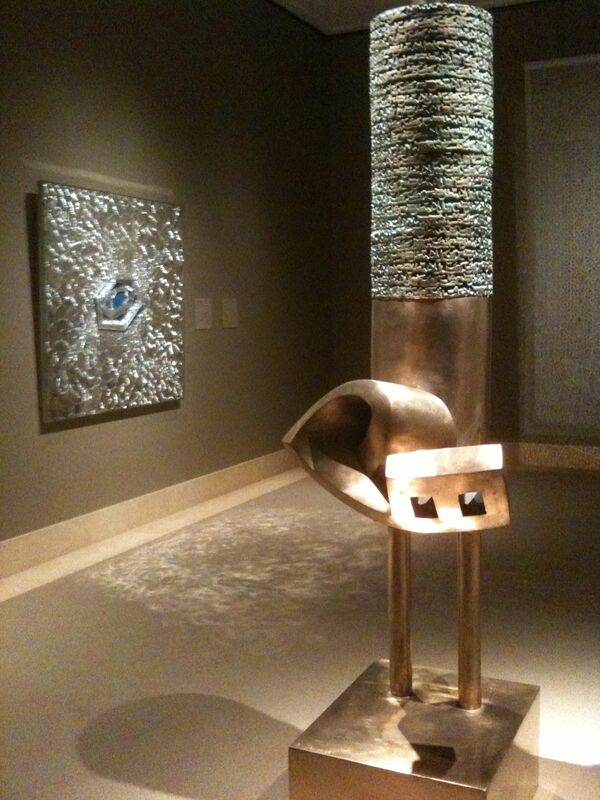 Contemporary Iranian Art installation at The Met with Tanavoli’s sculpture and Farmanfarmaian’s mirrored glass mosaic. You really don’t expect to find stunning contemporary art works way, way back in a remote corner of the Islamic Art wing, and you really don’t expect to see new, sparkly stuff from Iran. Surprise! Once you make your way back on the second floor, past the 13th century enameled and gilded glass from Syria, you’ll spy a secluded gallery with shimmering light. It’s Parviz Tanavoli’s dramatic Sufi-inspired sculpture at the center and Flight of the Dolphin, a mirrored mosaic by Iran’s most famous female artist casting its magic. Monir Shahroudy Farmanfarmaian, who made the mirrored mosaic, is probably Iran’s best-known female artist. In 1944, she studied in New York at Cornell and Parsons and got to know art-world luminaries like Pollack, Stella, and Warhol. It changed her life and her art, as you’ll hear in this video shot inside the gallery by ArtAsiaPacific. Detail of Still Garden (2011) by Afruz Amighi. Last weekend, the tiny show enjoyed a steady stream of visitors. Most were captivated by another truly remarkable piece – Afruz Amighi’s Still Garden. The closer you get to the wall-size hanging, the more amazement you’ll have. Afruz has cut intricate patterns into thin polyester fabric that’s commonly used to construct refugee tents and has projected white light through it. The light-shadow play inches behind have a mesmerizing effect that you just have to experience in person. Although everything’s now in the Met’s permanent collection, it’s worth making the journey through the Arab Lands upstairs and experience the light from Iran at the end. 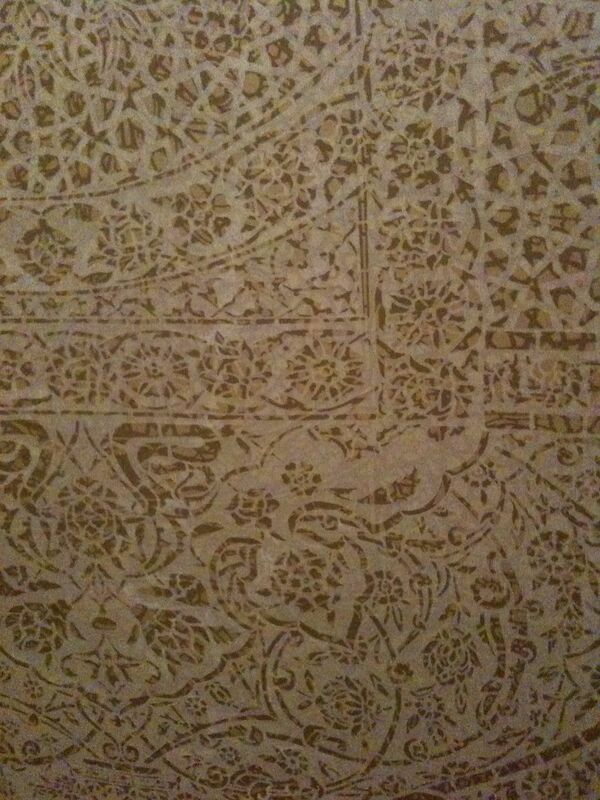 This entry was posted in Art, Museums and tagged art, culture, museums, video by mssusanb. Bookmark the permalink. She is a wonderful lady, and what a discovery you have made! These mosaics are spectacular.